It was a fun, surprising dish for us. Usually we cook fish in about two minutes to keep it tender. This dish had a much longer cooking time; in fact, some recipes called for cooking it almost 6 hours! It was also fun for me to practice my knife skills, since I had to bone and skin the wing myself (there was apparently a communication error at the fish monger). 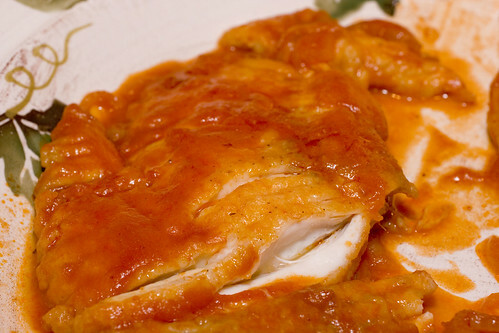 The result was a tangy, saucy dish with tender fish. We finished every drop. In a large skillet over medium heat, heat enough vegetable oil to coat the entire bottom, plus a bit extra. Season the fish with salt & pepper, then coat very lightly with flour. Shake off the excess. Cook each fillet about 30 second per side, until golden brown. Set aside on a plate. Pour most of oil out of pan, keeping about one teaspoon in the pan. Add sliced onions and more salt. Cook over low heat until soft, about five minutes. 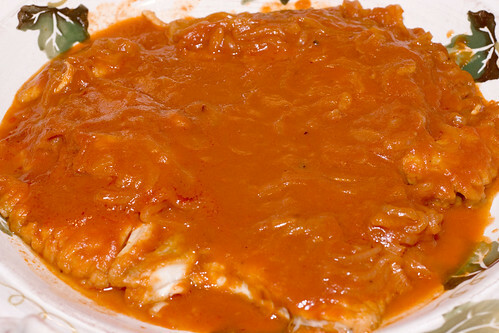 Stir in harissa. When well combined de-glaze with vinegar. Stir in tomato sauce, increase heat to medium, cook until sauce starts to bubble. Add fish back to pan, pour stock over, and shake the pan to combine a bit. Cook over low heat for 25 minutes. Plate with all the sauce. posted by Lon	at 01:45 PM	Filed under Fusion, Recipes. You can follow any responses to this entry through the RSS 2.0 feed. Both comments and pings are currently closed. very cool recipe. I have an idea for Food Mayhem. Once per month you should propose three recipe ideas and let your readers vote on the recipe they would most like to see you prepare and blog about. 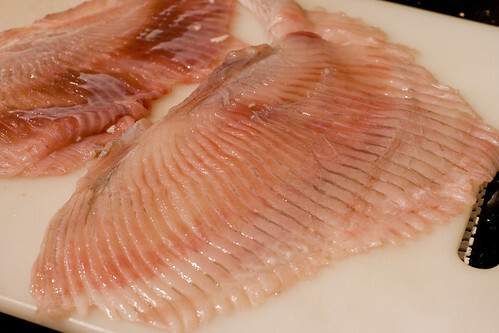 Never had skate, but there have been some really interesting recipes floating around out there. Like this one. The sauce seems like it’d be good on chicken too. Bill – Great idea! We think we’ll do that. Duo – Funny you mention it… at dinner Justin asked if the sauce would be suitable for chicken. My thinking is that it could work well for chicken, but I’d substitute chicken stock for the fish stock. Also, you’d probably have to stew the chicken a bit longer, like 45-60 minutes (just guessing). I second Bill G–you two make anything exciting, and it’s nice to be a part of the process! Genuinely fine post. I just came by your blog and would like to say that I’ve really enjoyed reading your posts. Anyway I’ll be subscribing to your feed and I hope you post again soon!